There are plenty of people around the world who would thoroughly enjoy spending their morning with a multitude of the most beloved fashion magazines. There are also plenty of people who would jump at the chance to have a morning with a bespoke jeweller. Mix the two together, and you just might be onto something special. On the 8th of February, we had the pleasure of hosting some of our favourite members of the media for breakfast at Intersect by Lexus, in DIFC. A beautiful breakfast of course, is a reason into itself for waking up and heading out – but with this morning there was an added incentive that meant our guests needed no enticing. 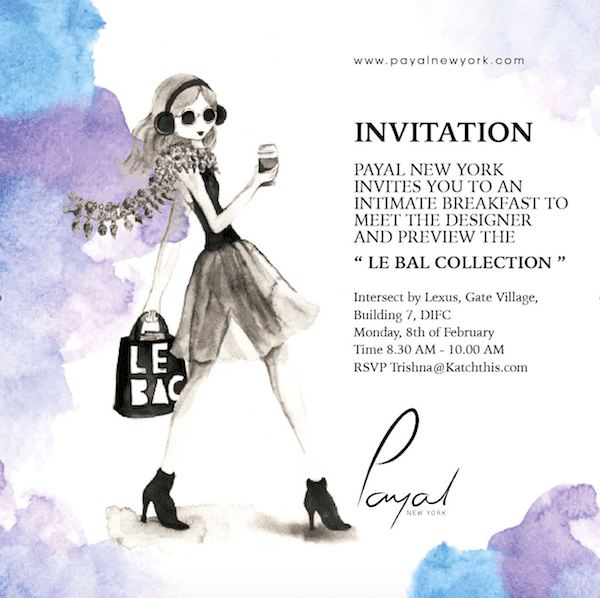 The intimate breakfast celebrated the work of and created an opportunity for introduction to Payal Mehta, of Payal New York. Payal is the founder of the bespoke jewellers, and holds the accolade of being the first independent jewellery designer to the Le Bal des Debutantes. The relaxed nature and curated guest list of the morning allowed each guest to take their time in talking to Payal herself, being lead through her collection and understanding the creation and ideas behind each unique piece. The morning suited the brand, an incredibly important facet of any presentation, allowing the experience of the brand itself to extend outside of the creation process and into an event itself. Our guests from Harper’s Bazaar, Savoir Flair, Grazia, Street Style Dubai and Shoestova all left with specially made silver pieces from Payal herself. Our thanks must also go to Intersect by Lexus for providing a fitting location and lovely atmosphere for us to host our breakfast.